The JamStands JS-MCTB50 Low-Level Tripod Mic Stand with Telescoping Boom from Ultimate Support is a heavy-duty low-level tripod-based mic stand with a telescoping boom that folds for easy portability. 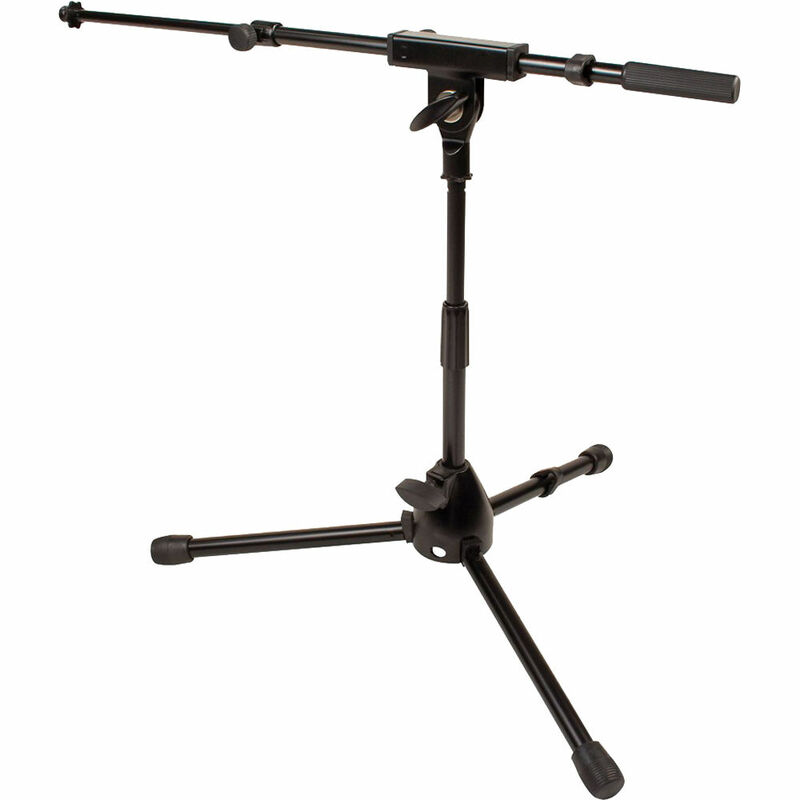 Box Dimensions (LxWxH) 21.9 x 4.3 x 3.5"
JS-MCTB50 Low-LevelTripod Mic Stand with Telescoping Boom is rated 4.0 out of 5 by 12. Rated 5 out of 5 by Matthew from Excellent build quality and function for the price! Bought this to hold a bracket that has a small synth on it. I got the boom version to have extra versatility for other uses. I was pleasantly surprised by the quality level for the price! I have a could of other Ultimate stands, which have held up well (one of them purchased in 1991!). I have not tried any of their Jam Stands line before this, but I would buy again based on this product! The adjustment hardware seems beefy enough, and the legs stay put when you fold them up for travel. Compared to a couple of other inexpensive stands I have use, this one seems to be a great value! Rated 2 out of 5 by BP from Buy the OnStage model before this one... I purchased this type of stand but the OnStage brand months ago. I needed a 2nd one and saw this Ultimate Support was one was few $$ less so decided to try it. The stand is very light and fragile. Seems like with under constant usage it will wear quickly. The Onstage brand similar model is sturdier. Rated 5 out of 5 by Marc Trainor from You can't beat this with a stick! I really felt I did my homework on this one, like I always do these days, but sometimes you can still lose out, but not with this stand. I have some other short stands that start with the letter A, that aren't too bad, except the base isn't metal and I've stripped them all out at the base. This one's got a metal base, and not only feels solid, has two telescope stages on the boom, but I was able to hang my Perception 220 on it with the metal shock mount included. I did have to pull the first part of the boom half way back to keep it from slipping, but I had the other end fully extended horizontally and it held still. Now, I never would position a stand like that, I usually tilt the boom up and don't even extend it all the way, but I just wanted to see what this baby could do. For 29bucks, I'm gonna get some more. Marc Trainor. Rated 5 out of 5 by Curtis from Excellent quality for the money! I purchased these to use in a live sound studio, so I wasn't looking for something to stand up to the rigors of the road. But I was pleasantly surprised at the quality of these stands out of the box. I actually believe these stands would hold their own on the road. They are a great deal and B&H is obviously a stand up company. It's now my go-to site when I need quality gear. Rated 2 out of 5 by Patrick from Huge disappointment Although seemingly well constructed, the boom would not hold a Shure SM58 (298 grams (10.5 oz)) without drooping and dropping into my lap. I used it out of the box on a recent gig expecting it to perform and could not keep the mic in place. I had to get a backup mic stand and set this one off to the side. The boom was not even fully extended. Disappointment. Rated 4 out of 5 by Just a drummer who produces from Horrible if you're trying to shave... but great if you're trying to mic something low. I'm using it to mic my snare. It's stable, and strong enough to hold the small mic that I'm using on it (Digital Reference tom/snare mic). It's perfect for what I need. I would give it 5 stars, but I've only been using it for a week. Rated 3 out of 5 by Eric from Bargain level at a bargain price You get what you pay for here. Fine for a studio where they don't move around much, but not road/gig worthy at all. Cheap parts and some of the joints don't tighten effectively. Rated 5 out of 5 by John from Great quality stands! These stands are really nice! They are sturdy, have a ton of adjustments and look great. Not much more to say about them..